To be fair it doesn’t take me long to take this gun apart and put it back together again so I try the bb’s first. however the upgrades you have suggest are first on my list, what brand of barrel and bucking would you guys suggest? I have not cleaned the barrel cus I only got it brand new a month back, but if it may help then it’s worth a go. What’s the best way of cleaning it? No not using bio’s, tbh I’m using non branded 0.2g’s of eBay. G&G mp5 mid cap mags? 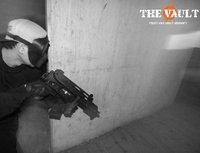 Recommend cqb sites in the West Midlands.